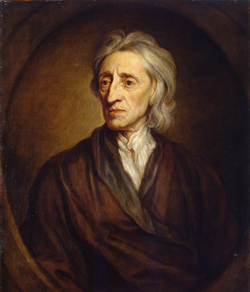 John Locke (1632–1704), Fellow of the Royal Society, English philosopher, Oxford academic and medical researcher, is regarded as one of the most influential of the "Enlightenment thinkers". He is known as the "Father of Classical Liberalism". His monumental work "An Essay Concerning Human Understanding" (1689) is one of the first great defenses of empiricism and concerns itself with determining the limits of human understanding in regard to a wide spectrum of topics. His writings not only influenced Voltaire and Rousseau, but many Scottish Enlightenment thinkers, as well as the American revolutionaries. His contributions to classical republicanism and liberal theory are reflected in the US Declaration of Independence. friends (Richard Lower) from Westminster (school) introduced Locke to medicine and the experimental philosophy being pursued by the virtuosi at Wadham. Locke received his bachelor's degree in 1656 and returned to Christ Church two years later for a master's degree. This led to Locke taking on tutorial work at the college in just a few years. In 1668, Locke was elected a fellow of the Royal Society. He graduated as a bachelor's in medicine in 1674, having extensively studied medicine during his time at Oxford. He worked with noted scientists and thinkers such as Robert Boyle, Thomas Willis, Robert Hooke, and Richard Lower. In 1666, he met Lord Anthony Ashley Cooper, the first Earl of Shaftesbury, who had come to Oxford seeking treatment for a liver infection. Cooper was impressed with Locke and persuaded him to become part of his retinue. The two grew close and Shaftsbury eventually persuaded Locke to move to London and become his personal physician. As Shaftsbury's stature grew, so did Locke's responsibilities – Locke assisted him in his business and political matters, and after Shaftsbury was made Chancellor, Locke became his Secretary of Presentations. Shaftsbury's influence on Locke's professional career and his political thoughts can't be understated. As one of the founders of the Whig party, which pushed for constitutional monarchism and stood in opposition to the dominant Tories, Shaftsbury imparted an outlook on rule and government that never left Locke. 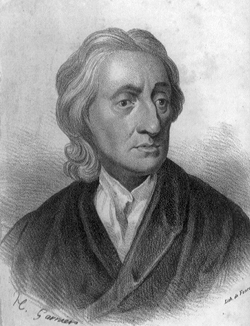 In the "Two Treatises of Government", Locke put forth his revolutionary ideas concerning the natural rights of man and the social contract. Both concepts not only created a stir in England, but also impacted the intellectual underpinnings that later led to the American and French revolutions. As England fell under a cloud of possible revolution, Locke became a target of the government. While historical research has pointed to his lack of involvement in the incident, Locke was forced to leave England in 1683 due to a failed assassination attempt of King Charles II and his brother, or what later came to be known as the Rye House Plot. He fled to the Netherlands, where he returned to his writing, spending a great deal of time re-working the Essay and composing the Letter on Toleration. Locke did not return home until after the Glorious Revolution. Locke accompanied the wife of William of Orange back to England in 1688. The bulk of Locke's works -- Essay Concerning Human Understanding, Two Treatises of Civil Government, and A Letter Concerning Toleration -- were published, in quick succession, on his return from exile. Locke's close friend Lady Masham invited him to join her at the Mashams' country house in Essex. Although his time there was marked by health problems due to asthma attacks, he nevertheless became an intellectual hero of the Whigs. During this period he discussed matters with people like John Dryden and Isaac Newton. He died on October 28, 1704, and is buried in the churchyard of the village of High Laver, east of Harlow in Essex, where he had lived in the household of Sir Francis Masham since 1691. Locke never married nor had children. Writings -- With the exception of the abstract of the Essay and other less important contributions to the Bibliotheque universelle, Locke had not published anything before his return to England in 1689, and by this time, he was in his 57th year. That being said, many years of reflection and preparation allowed him to publish books in rapid succession. In March 1689, Epistola de Tolerantia was published in Holland; an English translation, by William Popple, appeared later in the same year, and a corrected edition was published in 1690. The controversy, which followed this work, led to the publication of a Second Letter (1690), and then a Third Letter (1692). In February 1690, the book entitled Two Treatises of Government was published, and in March of the same year, the long-awaited Essay Concerning Human Understanding was published -- on which he had been at work intermittently since 1671. It met with immediate success, and led to a voluminous literature of attack and reply; young fellows of colleges tried to introduce it at the universities, and heads of houses sat in conclave to devise means for its suppression. Locke replied at length to one of his critics Edward Stillingfleet -- bishop of Worcester -- in January 1697. Stillingfleet answered to this in May, and Locke was ready with a second letter in August. Stillingfleet again replied in 1698, and Locke’s lengthy third letter appeared in 1699. The bishop's death, later in the same year, put an end to the controversy. The second edition of the Essay was published in 1694, the third in 1695, and the fourth in 1700. Other interests also occupied Locke during the years following the publication of his great work. The financial difficulties of the new government led him to publish Some Considerations of the Consequences of Lowering of Interest and Raising the Value of Money in 1691, and Considerations on the latter question, four years later. In 1693, he published Some Thoughts concerning Education -- a work founded on the letters written to a friend. In 1695, The Reasonableness of Christianity appeared, followed by A Vindication -- against certain objections. This was again followed by a second vindication two years later. Locke's religious interest had always been strongly marked, and, in the later years of his life, much of his time was given to theology. Among his writings published after his death are commentaries on the Pauline epistles, and a Discourse on Miracles, as well as a fragment of a Fourth Letter for Toleration. Third -- Coercing religious uniformity would lead to more social disorder than allowing diversity. With regard to his position on religious tolerance, Locke was influenced by Baptist theologians like John Smyth and Thomas Helwys, who had published tracts demanding freedom of conscience in the early 17th century. Political Theory -- Locke's political theory was founded on the social contract theory. Unlike Thomas Hobbes, Locke believed that human nature is characterised by reason and tolerance. Similar to Hobbes, Locke believed that human nature allowed men to be selfish. This is apparent with the introduction of the currency. In a natural state, all people were equal and independent, and everyone had a natural right to defend his “Life, Health, Liberty, or Possessions". Like Hobbes, Locke assumed that the sole right to defend in the state of nature was not enough, so people established a civil society to resolve conflicts in a civil way, with help from the government in a state of society. However, Locke never refers to Hobbes by name, and may instead have been responding to other writers of the day. He also advocated governmental separation of power and believed that revolution is not only a right but an obligation in some circumstances. These ideas would come to have profound influence on the US Declaration of Independence and the country’s constitution. On Price Theory -- Locke's general theory of value and price is a supply and demand theory, which was set out in a letter to a Member of Parliament in 1691, titled Some Considerations on the Consequences of the Lowering of Interest and the Raising of the Value of Money. Supply is quantity and demand is rent. “The price of any commodity rises or falls by the proportion of the number of buyers and sellers” and “that which regulates the price of goods is nothing else but their quantity in proportion to their rent.” The quantity theory of money forms a special case of this general theory. His idea is based on “money answers all things” (Ecclesiastes) or “rent of money is always sufficient, or more than enough,” and “varies very little”. Regardless of whether the demand for money is unlimited or constant, Locke concludes that as far as money is concerned, demand is exclusively regulated by its quantity. Monetary thoughts -- Locke distinguishes two functions of money, as a "counter" to measure value, and as a "pledge" to lay claim to goods. He believes that silver and gold, as opposed to paper money, are the appropriate currency for international transactions. Silver and gold, he says, are treated to have equal value by all of humanity and can thus be treated as a pledge by anyone, while the value of paper money is only valid under the government that issues it. Locke argues that a country should seek a favorable balance of trade, lest it fall behind other countries and suffer a loss in trade. As the world money stock constantly grows, a country must seek to enlarge its own stock. Locke develops his theory of foreign exchanges, that in addition to commodity movements, there are also movements in country stock of money, and movements of capital determine exchange rates. The latter is less significant and less volatile than commodity movements.